Blair and Dan in "While You Weren't Sleeping." You gotta love Dair in action. Lily doesn't have a lot of friends on the Upper East Side right now. At least not in the 17-25 age range. Damien is back once again. This guy is like a bad penny. 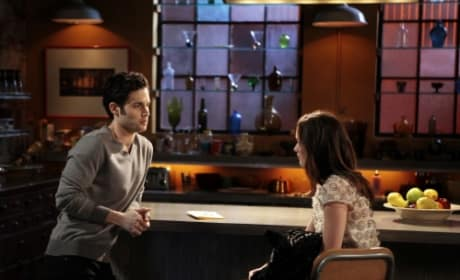 Nate and Raina in a shot from the February 21, 2011 episode of Gossip Girl. Should be a very interesting week. As in Chuck and Lily? Get it?